Motorola today launched Moto G7-series smartphones at an event in Brazil. 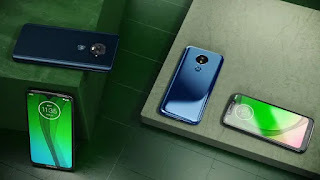 Moto G7 lineup includes Moto G7, Moto G7 Plus, Moto G7 Play, and Moto G7 Power smartphones. Snapdragon 636 processor with 4GB of RAM and 64GB of storage, which can further be expanded using the microSD card slot (up to 512GB).On Camera, it has a 16-megapixel primary sensor with an f/1.7 lens and 5-megapixel secondary sensor with an f/2.2 lens and 12-megapixel front camera packed by a 3000mAh battery. Moto G7 Power has a 6.2-inch HD+ (720x1520 pixels) Display powered by Qualcomm Snapdragon 632 SoC with 3GB RAM and 32GB Storage. It has a 12-megapixel Rear Camera and 8-megapixel front Camera. Packed by a 5,000mAh battery. Moto G7 Play sports a 5.7-inch Max Vision screen with HD+ (720x1512 pixels) Display powered by Qualcomm Snapdragon 632 SoC with 2GB RAM and 32GB of inbuilt storage with a microSD card slot (up to 128GB) It has a 13-megapixel Rear Camera with an f/2.0 lens and an 8-megapixel selfie camera on the front with an f/2.2 lens. Packed by a 3000mAh Battery. Moto G7 carries a price-tag of $299, whereas Moto G7 Plus priced at EUR 299.99. The Moto G7 Power will retail at $249 and Moto G7 Play at $199. All four phones are first going on sale in Brazil and Mexico starting today and will roll out globally beginning mid-February.